One reason has everything to do with safety. The Berkeley Group LLC, dba NV JETS, are raising safety awareness when it comes to flying privately. 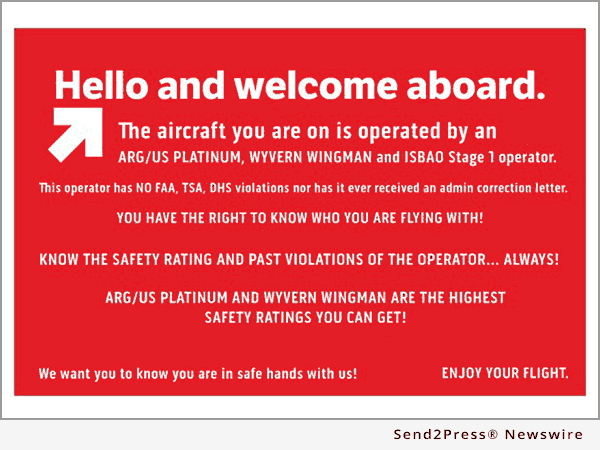 With their new placards, they are alerting clients across the country to check for safety ratings and violations of the operators they fly with. Many individuals don’t know that only 10 percent of private jet charter operators have any sort of safety rating? Kind of scary when you think about it. Many individuals are unaware that third party auditors, most notably, Wyvern LTD, ARG/US and the ISBAO conduct audits on Operators every week in the United States. These phenomenal organizations apply standards, higher and more stringent than that of the Federal Aviation Administration and their intense, highly stressful audits dive further into compliance and regulatory requirements and grade operators based on their standards. In depth reviews of Safety Management Systems, risk mitigation and internal audits of their own operation are core principals of passing a third party audit. Additional requirements such as “type” maintenance training for your mechanics, a longer prohibition from alcohol for pilots as well as scheduled duty start and end times. In today’s age where phenomenal systems like the Safety Intelligence Report (SIR) from Wyvern are available, companies can verify on behalf of their clients detailed background information on charter operators including and ensuring the operator has an operating certificate, the aircraft they are licensed to fly within their fleet listings, who is on an operator’s pilot roster, an operator’s management personnel and whether the aircraft has current insurance. For U.S. operators, accident/incident histories compiled from AID, EIS and NTSB reports are also available within a Safety Intelligence Report. These reports are on a membership basis only and should be available for the clients review by the broker. Requesting a Wyvern WINGMAN or ARG/US PLATINUM report is currently the ONLY way that clientele can verify a safety rating through either auditing firm regarding the operator they are flying with. You have the right to know but you have to ASK! NV JETS are proud to hold the highest ratings possible from the two most prominent safety auditing companies in the world. NV Jets are the ONLY operator based in NEVADA to proudly carry the WYVERN WINGMAN and ARG/US PLATINUM award for their outstanding commitment to SAFETY. NV JETS can be reached 24 hours a day, 365 days a year at: 1-855-5-NVJETS, or Info@nvjets.com. At NV JETS we understand that air travel using a major airline is not the ideal option in terms of privacy and time, that’s why we endeavor to provide the most efficient service, allowing our jets to be “wheels up” within one hour from booking. Whether you are interested in chartering, leasing, purchasing or aircraft management our extensive background in aviation means we will find the right program to fit your needs. NV Jets the first name for a Private Jet Charter in Las Vegas.